The obvious place to start is with the franchise itself. Were you much of a fan before getting involved? Is it your favourite both as a fan and a filmmaker – or do you have a soft spot for one of the others purely as a fan? It's the first for both, to be honest. Both for motivating me as a fan, and as a filmmaker it was rare to see a film where the hero wasn't perfect. He's a guy with a stutter, a guy who's messing up; so flawed, but so real. I remember talking to Sly about it when I finally got to meet him in person, and he told me, 'People didn't want me to play the role,' because he wasn't the suave guy. They didn't understand that Rocky was going to be this bumpy character. How did you get involved with Creed II? Sly was originally going to direct, and two things happened. One, he wanted to shoot Rambo [5: Last Blood], which he's doing right now – he wanted to prep and do that. And two, he wrote the first draft and, to be totally honest, I guess he felt he needed a younger voice. I met with him first at the studio and he was very adamant about, 'Hey, I think I've got the structure cracked, but how do we really dig into the growth of Adonis and Bianca?'. He wanted to make sure that felt alive. And I helped him with developing the Dragos a lot. When I got the call, it was one of those things where you're excited about the project because it's a great franchise, and at the same time you're scared, because it's a great franchise and you're in charge and responsible for doing the sequel. You'd worked in the indie sphere before. What was it like moving to a major Hollywood franchise? You know what? To be totally honest with you I don't think it was that different in the sense of, I guess, mentality. The workflow is different. You have a larger crew. You're trying to make sure you get your vision across to a bigger board, so to speak. Bigger department heads; more people. But going from a small budget film? I mean, my first film, The Land, it has a similar ensemble piece vibe. Everyone feels pretty grounded. Everyone has an arc. And those are things that I brought from that film to this one. Whether you're doing a small project or a big one, you're really just focused on the fundamentals of filmmaking, which is storytelling. So I didn't get too caught up in the… it was a smaller project and here comes a big one. There are definitely times when I'm nervous on set, certainly in the first week, because there's things I haven't done before with visual effects. But I certainly had a great support system. Presumably Stallone was part of that support system. Did he have much input into what was happening as you were shooting? Going into the film, were you aware it would be Stallone's swansong in the Rocky role? All manner of sports have appeared on the bigscreen over the years, but boxing is one that filmmakers keep coming back to. What is it that makes boxing so well-suited to cinema? Good question. I wanna say it's the fact that the sport itself translates very well and it's sort of a metaphor for life in many different ways. It's a sport which you're doing by yourself. You're not necessarily in the ring with five other people. It's not like soccer or football or basketball. It's all you. It's a mental game. Sometimes it can be a chess match. There are so many moments within boxing, you know, from the training aspect to the actual fighting, that just register with life. So when you watch it, you can apply it to anything. Arguably the best boxing movies are those that hit as hard outside of the ring emotionally as they do physically inside it. How did you go about balancing those two sides of the story in Creed II? At first I didn't focus too much on the boxing, in all honesty. I wanted to see if I could make a full-on drama without any boxing. So when I got the script I was thinking, if there weren't any boxing matches how would I make the story still work? And that's when I came up with the idea of the hearing test, all these small problems… Sly needs to see his son, that wasn't in the original draft. So I was approaching it that way. Then as we created it and went back to the fights it was like, 'Oh, there's ways to… he needs to climb back up out of the ashes, we can connect that to this storyline.' We were able to thread it together by treating it as drama beforehand. When it came to staging the fights, did you have a clear idea of how you wanted them to look and feel? Did you take any inspiration from other boxing films? I had no idea, it all happened so fast. I got the call right before Thanksgiving, and then I rewrote the script over three weeks, over Christmas break. On January 2nd I was ready to get my plane ticket to go out to Philly on January 6th. It was so fast that when we started shooting in March, I had basically two months to watch as much material and try to find a unique way to tell the fighting stories. Absolutely. My head is still ringing from the blows landed when I saw the film. How important was sound design to bringing the audience into the fights? Sound is crucial. If you've seen my first feature, The Land, you'll definitely see that carry over. It's a sports movie, too, sort of – it's got skateboarding at the heart of it. And sound totally told the story and helped the visuals a lot. And I think with this particular picture I knew that sound was going to be important. I knew that feeling the blows, feeling the wind of the blows – which is something I felt was missing from some of the boxing movies I'd seen, you don't necessarily hear the wind behind the punch – that just elevates… you see people trying to move because they know it's coming, coming with vicious intent. I kind of tapped into that. And I played with colours for each fight. And mood. Whether or not we're doing handheld, Steadicam, how smooth we want it… things like that take a juxtaposition between each one and tell a different story. Sticking with sound for a moment: the Rocky theme. This would be easy to fall back on too often, so how did you approach using it? That one was a scary one, let me tell you. Once we realised that we were stepping into ‘Creed world' – it's a Creed movie and we wanted to establish that – I was pulling a lot from the first film as far as music goes. So it was very tricky to find when would be the right place to use the Rocky theme. The two that I was juggling with – myself and the studio, because we were going back and forth trying to figure out which was the right spot – one was when Creed rises up from the ground in the training montage because it felt so epic, and the second is a knockout. And it made more sense, obviously, to go with the fight. But the Bill Conti theme is so iconic and every time people hear it, the raw instruments, they get excited. So we had to preview it a few times, adjusting it here and there. Sometimes it would be right on the punch, sometimes it would be right on the fall… We had to adjust it here and there by frames to find that sweet spot. I saw him in Sly's office. It was this crazy YouTube video of him just working out. He looked insanely beastly. He looked amazing, but I didn't know if he could bring what we wanted to the table. Sly had a different approach. He was going to have this Drago character who was all fear… just yelling and screaming. And Florian definitely works for that. But when I pitched him my idea of telling the Drago side, even making them a little bit vulnerable, he wasn't sure if Florian could pull it off. So we had to bring him down to L.A. We sat him in a room with me and Michael B. Jordan. Then there was a day with me, him and Dolph Lundgren. You know, just trying to get a vibe for him. Meanwhile we're auditioning other people, pro-boxers. But he just connected with all of them, it was great chemistry. When it comes to Dolph Lundgren, how did he respond to the direction you wanted to take with the Dragos? He loved it. He was afraid he was going to be the same cyborg-type robotic character from the first go-around. He was afraid that after being the villain for so many years it was going to be a set-back and really tie him to the politics of Russia. And he was relieved, from what he told me, that we didn't go in that direction at all. We wanted to make him human, and he felt like this was a shot to play a dramatic role. He's always being cast as the Universal Soldier and this, that or the other when it comes to holding a gun and yelling. And being stoic with this deep accent. Now he had the opportunity to have layers and dimensions. And we worked hard at that. We had coaches on set. He was learning Russian. He really wanted, I guess, to use this as his opportunity. Rocky IV was pretty over-the-top even for the 1980s. Was it difficult to get a handle on how to bring these characters back in a more grounded, believable manner? Oh, completely. I wasn't sure if we ever did have a full handle on it. On set, when you're making the film, we were always checking to make sure we hadn't gone too over-the-top. Because it's easy to do with this kind of plot and these kinds of characters, and we wanted to make sure that the drama felt real. So we would just check-in with each other. There were times when Dolph would come to me and ask, times when I would go to Dolph. We all had the same vision – but it's a tough one to balance, because you to have to play it to some of the commercial aspects, there are expectations when you're bringing back iconic characters. But at the same time, we're trying to figure out, 'What can we do to make sure it's real? What can we do to make sure it's authentic?'. Clearly you watch a lot of movies. 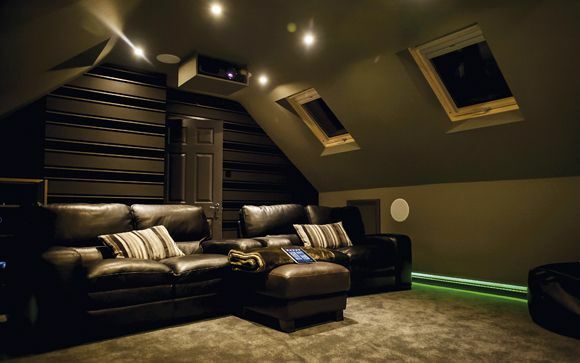 Do you have a home cinema setup? I don't. I need to get one. Sly has an amazing home theatre setup. I'd love to have one like his! And to finish up, what's next for yourself? I recently sold a project to Legendary [Films] called ByAll - and that was released, AKA leaked, I think, recently. So I'm working on that. And then I'm also working on this piece I've been writing about the first African-American NASCAR driver. But at the moment I've just been writing and reading anything that comes my way. Anything that I'm passionate about, I'm going to do. So I'm not going to run to the next Marvel film or Creed III. Just anything that speaks to me, to be honest – and that can be big or small. Creed II is available to own on 4K Ultra HD™, Blu-ray™ and DVD now, courtesy of Warner Bros. Home Entertainment.